Welcome back to a Solos favourite! We return to sunny Almeria to stay at the wonderful Almerimar Golf Resort. If you fancy a golf holiday and beach location combined, in one of Europe's sunniest climates, then Almerimar is the place for you! Play golf in Almeria, the sunniest part of the Mediterranean! Your hotel is on the golf course. There is a marina and beach within walking distance of our hotel. Enjoy playing golf with other Solos golfers! 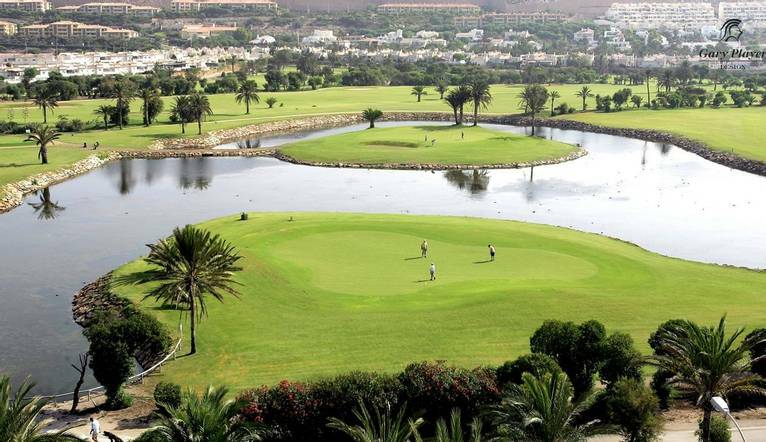 The resort has everything you need for a relaxing enjoyable golf holiday; a 27 hole course on site, a quality hotel with all the amenities you would expect in a superb location, with a marina and beach on your doorstop with many bars and restaurants should you fancy a change of scene. This will provide a great venue for our sociable golf weeks where we include 5 rounds of organized mixed team competitions. Handicap certificates are required. The course is located right next to our hotel. An easy course to walk, which provides a good challenge for all standards of player. It has a Florida feel due to the many palm trees. Designed by the legendary South African, Gary Player, the wide fairways, bordered by the amazing palm trees, are punctuated by a number of beautiful but dangerous water hazards. The signature hole on the course is the 10th – a 167 yard island green par 3 – reminiscent of the 17th at Sawgrass – a real test of skill and precision. This popular hotel sits right in front of Almerimar Golf Course and within easy walking distance of the resort's marina and beach. When you are not playing golf you can relax in one of the hotels pools or in the superb spa for a bit of self indulgence! With a range of bars and restaurants and the local resort on your doorstep, you will certainly be spoilt for choice in this superb hotel. Hotel Golf Almerimar enjoys a great location within walking distance of the marina and beach and sits directly on the Almerimar Golf Course. The well appointed rooms feature satellite tv, telephone, hairdryer, air conditioning and safe. WIFI is also available. Facilities include a buffet restaurant as well as a choice of other speciality restaurants and bars, indoor and outdoor swimming pool with spacious sun terraces and an excellent spa. The transfer time from Almeria Airport to the Hotel is approximately 1 hour, depending on weather and traffic. This trip is for golfers with a handicap of 36 or lower for ladies and 28 or lower for gentlemen. Please advise our Reservations team of your handicap at the time of booking, and if you have a certificate please ensure you take it with you on the trip. This enables the Tour Leader to assess everyone’s ability, so that rounds and competitions can be organised fairly. If you are uncertain about these requirements please do not hesitate to contact us. We will be happy to advise you. We suggest a Group Collection to cover transfer drivers, and hotel staff of €15.00 per person. Your Tour Leader will collect this on your behalf and distribute it accordingly, thus relieving you of the burden of who, when and how much to tip. The tipping of housekeeping will be left to your individual discretion (a small amount left in your room on departure should cover this and would be much appreciated). As is customary, ‘the hat’ will be passed around for the driver and guide on all optional excursions. For any meals that are not included in your itinerary, or taxi fares, your Tour Leader can advise of an appropriate add on.